In a glacial process, bedrock is eroded, broken or relocated by the direct force of glacial ice bearing on the rock or by pressurized glacial meltwater moving through the rock. In a periglacial process, bedrock is disrupted by frost wedging, with or without the presence of glacial ice. Sometimes, bedrock disruption can result from hybrid glacial/periglacial processes. A main goal of the Frost Heaved Bedrock section of Heart of Avalonia is to look at instances of bedrock disruption and then try to determine the type of process that occurred. A glacial environment existed in Heart of Avalonia for tens of thousands of years leading up to the Last Glacial Maximum (LGM). After this time, conditions of climate and glaciation fluctuated, eventually transitioning to present-day warm, ice-free conditions. Four distinct thermal regimes can be associated with the fluctuations in climate and ice cover. These are illustrated below. The thermal regime (ground frost vs. depth) is important in understanding the forces leading to bedrock breakage and movement. 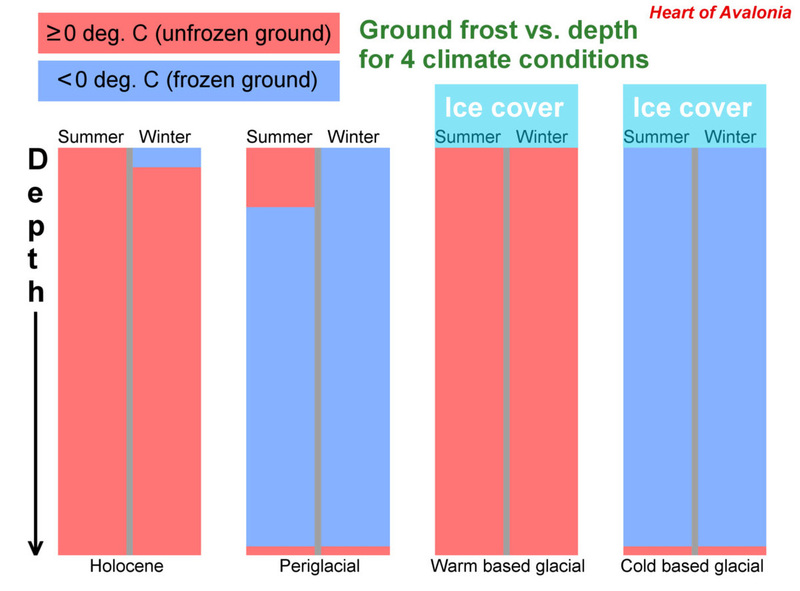 The ground frost profile is equally important in attempting to work backward and interpret changes in climate from patterns of bedrock disruption. Holocene: There is no permanent ground frost on the Island of Newfoundland in the present climate. Thus, in summer the entire rock column is unfrozen and, in winter, freezing occurs down to a relatively shallow depth of 1-2 metres. Periglacial: A much colder climate existed during glaciation and during periods leading up to the abrupt commencement of Holocene warming. Areas of Heart of Avalonia that were unglaciated after the LGM, but before the Holocene, may have experienced a periglacial climate. This would entail a significant depth of year-round ground frost (permafrost), ending at the depth where geothermal heat flow raises the rock temperature to above 0 deg. C. During summer, melting would occur in an upper layer (active layer) extending down a few metres. Warm-based glacial: During a significant portion of the Wisconsin glaciation, especially during the time of glacial retreat following LGM, Newfoundland glaciers were warm-based or temperate, having meltwater distributed throughout their volume. The simultaneous presence of water and ice stabilizes the thermal regime at exactly the pressure melting point of ice. A temperate ice blanket precludes seasonal variations in rock temperature, making frost wedging impossible. Cold-based glacial: During the earlier and middle portions of the Wisconsin glaciation, it is possible that polar glacial conditions, such as now exist in parts of Greenland and Antarctica, existed in Newfoundland. Under these cold-based glacial conditions, bedrock would remain frozen year round, extending from the surface down to a depth where the geothermal gradient crossed above the freezing point. 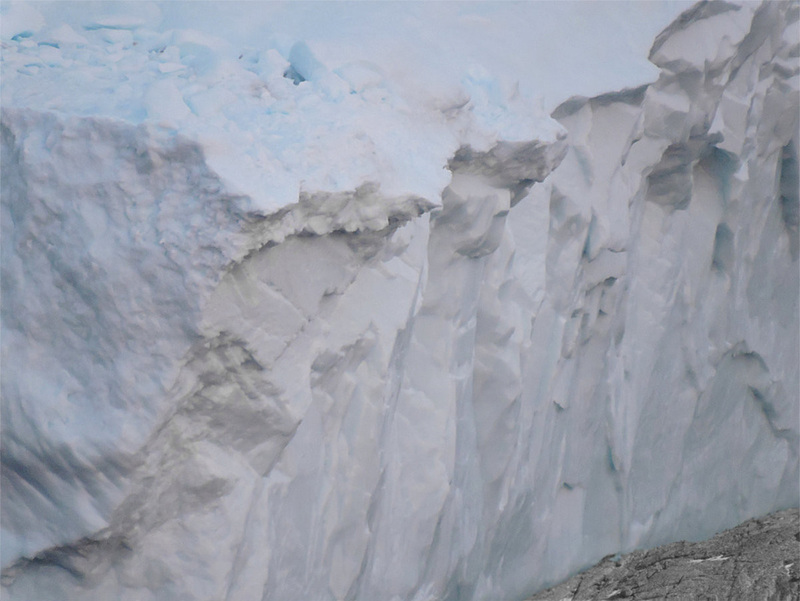 Frost wedging would not occur under a cold-based glacier, although bedrock could be displaced by ice loading as overlying glacial ice deforms in creep. A complex polythermal glacial environment could have existed in Heart of Avalonia during periods of rapid climate change as deglaciation unfolded at the end of the Wisconsin. In such an environment, glaciers that were warm-based in their central, thicker regions, could transition to cold-based glaciers near their perimeter. Sudden cooling intervals (stadials) that took place while deglaciation was underway would account the development of polythermal glaciers. Time-dependent ground-frost profiles with more melt/frost transitions than illustrated in the diagram above, might develop under mixed periglacial and polythermal glacial conditions. This type of high-thermal-gradient environment would be particularly effective at disrupting bedrock.